Day 1: ARRIVE IN LISBON, PORTUGAL. Day 3: FÁTIMA. EXCURSION TO VALINHOS. 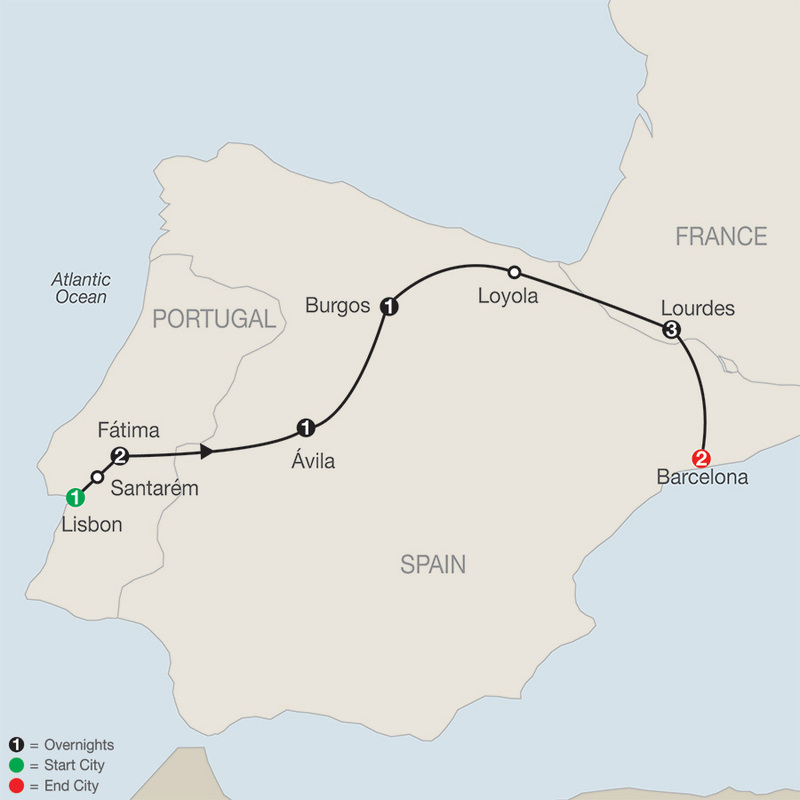 Guided sightseeing, visit the Sagrada Familia Basilica; farewell dinnerMotorcoach. Free Wi-Fi available on your motorcoach and in most hotel lobbies. Situated in the center of Lisbon, the hotel looks out over the historic St. George's castle and is just steps away from Rossio Square. Among its outstanding amenities are the panoramic Varanda de Lisboa restaurant, offering stunning views of the old city and excellent cuisine, as well as a bar and wine cellar, where wine tastings with an expert sommelier are available. Tram Nr. 28 starts its route in front of the hotel, providing an ideal way to explore the city. This 84-room hotel is defined by a warm and familiar atmosphere set in a modern building. At the restaurant you can enjoy fine dining with a menu based on tasty Portuguese specialties. Free internet Wi-Fi connection is available throughout the hotel and there is also a bar serving refreshing drinks. Located in the historical part of the city and set within a 16th-century stone palace this unique 144 room property offers Free Wi-Fi internet access throughout and has an elegant restaurant serving regional cuisine, a Renaissance-style courtyard cafe with a piano and an English style bar. The Silken Gran Teatro Hotel has an excellent location, perfect for visiting the city at ease, as it is in right in the shopping area of the city. Lovers of leisure and night life will find plenty to do just a few steps from the Hotel. Its rich past gives it the authentic character that has made its reputation. Its majestic architecture houses air-conditioned rooms beautifully decorated in Louis XVI style. A large modern 338 room property, located within easy access to many of the city's major sights and attractions. Facilities include a choice of two restaurants a gym and a seasonal rooftop swimming pool and sun terrace with panoramic city views.